Jonathan Safran Foer's remarkable new novel. We rarely need excuses to read novels as autobiographical. It's easier, after all, to believe that whatever in a fiction smacks of truth—the way a marriage's arguments skip and warp, for example, or the lesson that we pay for being known in the coin of embarrassment—must borrow from some ready-to-hand reality. Jonathan Safran Foer has never been shy about the fact that his fictions borrow material from his life. 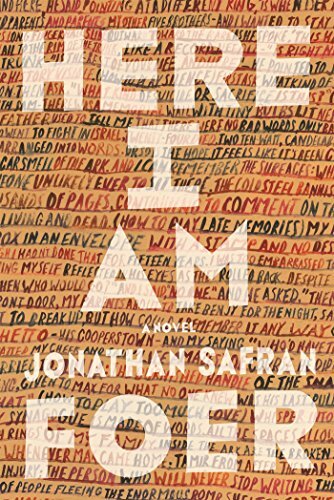 Consider the central character in his debut novel, Everything Is Illuminated (2002): he is named Jonathan Safran Foer. Moreover, the two Foers' stories are recognizably similar, if simply in the way that any two triangles, say, are recognizable as having the same shape. To these parallels we could add the example of Here I Am's most prominent character, Jacob Bloch. In the aftermath of his grandfather's funeral, wandering through an unpopular quarter of the Jewish cemetery, Jacob resolves "to remember all of it, to use it all later: the rabbi's shoelaces, the untied melodies of grief, the hardened footprints of a visitor in the rain. It was his blessing and his curse," Foer writes of his character, a TV writer. "Everything was always material." Which seems like reason enough to assume that the novelist has cribbed from his life, as well. Nonetheless: all those objections to one side, I would first argue that whatever Foer has pirated from his own story in order to write this novel is inconsequential. Because despite the spectacle of a catastrophic earthquake in the Middle East and the moving pageant of a family foundering, this beautifully plotted book is not just about its plot (or even—and this is its peculiarity—just about what its plot means). It is a book equally about its own unrealized counterplots and about what those unrealized narratives would have meant. And do mean, even as they remain unconsummated. Here I Am is not, in other words, just about what happens, about who acts and who bears the brunt of things, about which conversations signal endings and which signal beginnings. Yes, it contains all of that. It is also, however, a book about what could have happened; about who might have second-guessed themselves and who might not have delayed so long; about which unsaid words, substituted for silence or euphemism, would have added to the longevity of a relationship or, perhaps, curtailed it. More simply still: Here I Am tells a story, and it lays out that story's counter-narrative, its "otherwise." Take Jacob and Julia Bloch's divorce. It is, as divorces go, amicable, and it is, because divorces are, brutal. Foer's devoted fans will find it hard not to speculate: does the end of the Blochs' fictional marriage resemble the end of the writer's real marriage? Maybe. Maybe not. But that question lies well beside the point, and here's why: Here I Am doesn't just lavish proportional and convincing details on the story it tells; it also spends attentiveness on the story it might have told. So that, for instance, when Jacob and Julia revisit an inn where they stopped for a night early in their marriage, Foer sets out their dialogue—fond, funny, weary—but he simultaneously drafts a hypothetical conversation for them, the conversation the two could have had "if they'd said what they were thinking." It concludes this way: "But he didn't say anything, and neither did she… . All communication had become subterranean: shifting tectonics, felt on the surface, but not known."